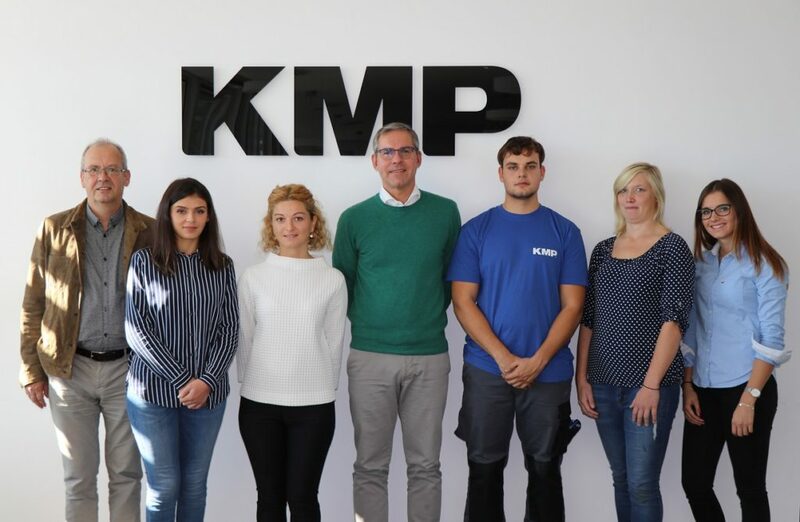 Five young candidates began their apprenticeship with KMP in September and October this year: the three Industrial Clerks Fiona Asjodi, Nestani Mindiashvili and Laura Staller as well as the two Logistics Specialists Stefan Kainzmaier and Christine Hirtreiter. 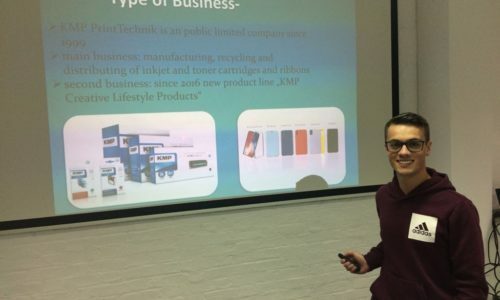 They already completed their first lessons in vocational school – the follwing months will provide us with an opportunity to teach them all about inkjet and toner cartridges and CREATIVE LIFESTYLE PRODUCTS. Welcome to KMP! We will give our best so that the next three years of your apprenticeship will be full of positive challenges. 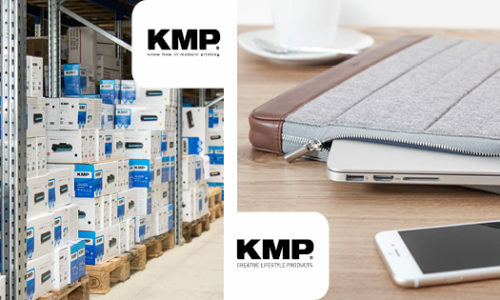 More than half of KMP’s employees have been with us for more than 10 years. 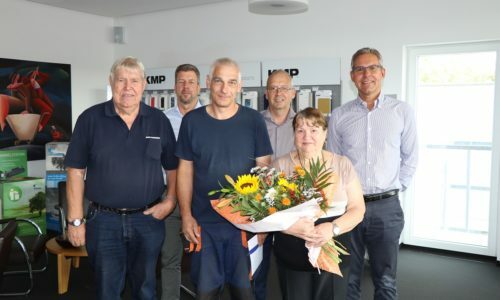 Heinz G. Sieg and Jan-Michael Sieg expressed their gratitude for Apollonia Bär’s 21 years of service in the Dispatch Department and others. 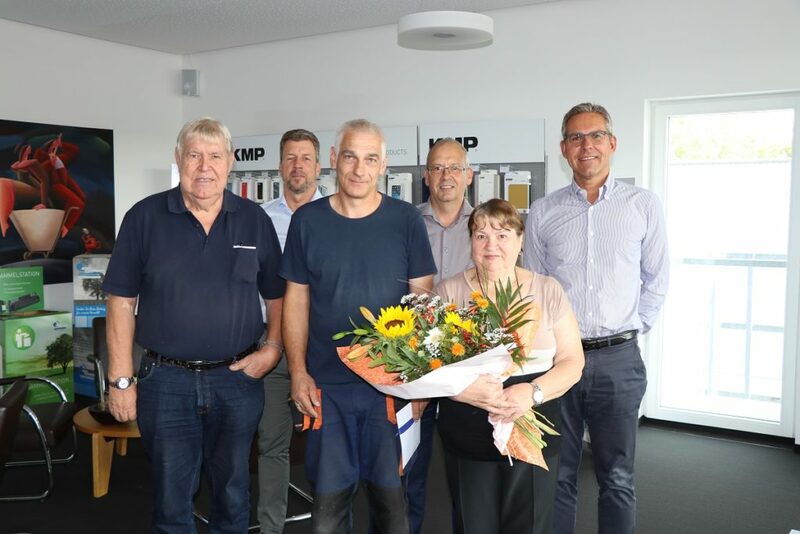 She is looking forward to her well-deserved retirement, while Gerhard Ammerich (Electrics) entered our company 10 years ago and will gladly continue his work as an electrician. Thanks to both of you for being part of our family and for contributing to KMP’s success! Mahmut Demirkaya has been a loyal employee of KMP since the 1st of August 2008. We applaud the achievements Mr Demirkaya has made throughout the whole decade as a developer of monochrome toner. Jan-Michael Sieg, Werner Watzinger and Jürgen Baur were proud to hand him a small gift in appreciation of his efforts. All of your colleagues congratulate you on this milestone and thank you for continuing to work with us for many months to come! 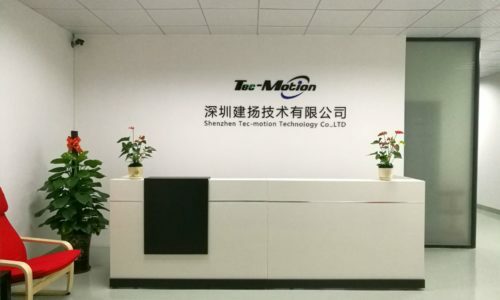 The KMP shareholders acquired a 49 percent ownership stake in Shenzhen Tec-Motion Technology Co., LTD. The Chinese company develops and produces electronic fittings for many fields of application, including power adapters for mobile devices and fitness equipment as well as sensors for health and environment monitoring. KMP will integrate part of Tec-Motion’s products into its own range of goods and have them manufacture articles developed by KMP, too. Tec-Motion started it’s business in 2015. 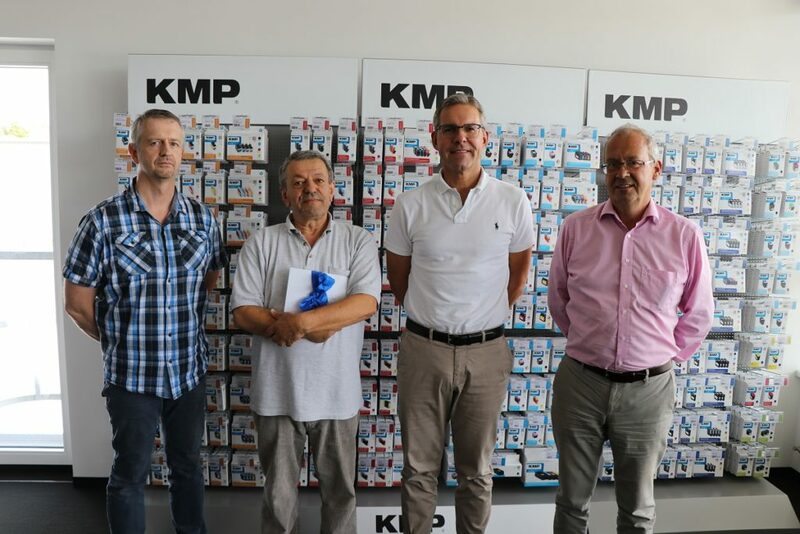 KMP will distribute Tec-Motions’s private label products in Europe and offer high-quality customer service for them. At the IFA trade fair in Berlin, taking place from 31 August – 5 September, both companies will present their consolidated expertise to the general public. 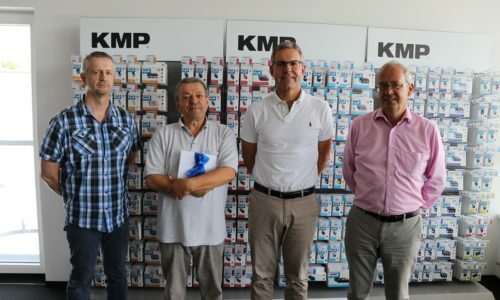 KMP PrintTechnik AG changed its name to KMP AG. Producing printing supplies, mainly toner and inkjet cartridges, is still our core business. However, we want our name to reflect the changing assortment and include new product lines like our accessories for mobile devices, too. 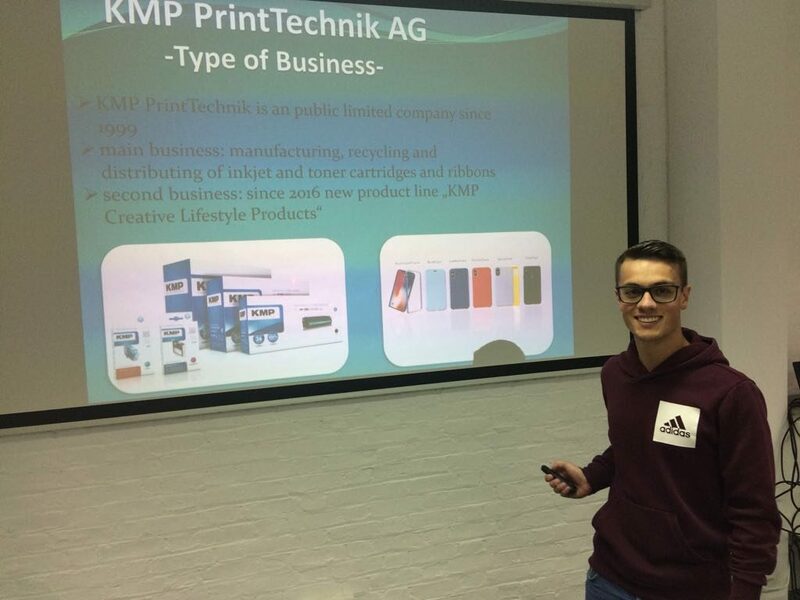 As part of a three-week study trip to London, KMP’s apprentice Stefan Harböck takes the course „Doing Business in an Englishspeaking Environment“ at the European College for Business and Management. After completing the intensive English module, Stefan Harböck will be ready to work in an international environment. Passing the apprenticeship’s final exam, he will also be certified „Kaufmann/-frau International Certificate (KIC)“. 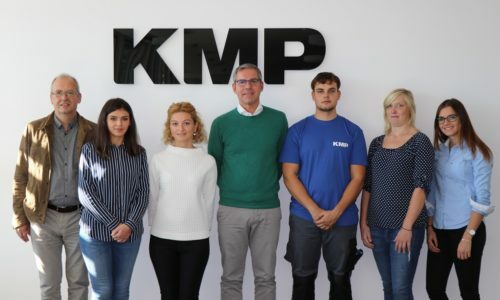 It’s not the first time that KMP PrintTechnik AG and the vocational school in Pfarrkirchen send their apprentices abroad to join the EU-funded programme. The participants are given the chance to enhance their language skills by holding presentations, attending business seminars, creating project reports and – last but not least – passing the final test. KMP is happy to see that Stefan Harböck voluntarily takes on additonal training. He will hopefully gain important insights that he can put to use and share with his KMP colleagues. Stefan: Good luck with your courses and have fun in London! 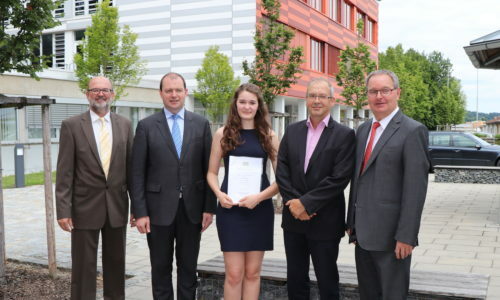 Our trainee Selina Spielmannleitner was awarded the Lower Bavarian State Prize at a ceremony. Ms Spielmannleitner who finished her training for industrial clerks, received this prize for the top grades in her vocational school’s leaving certificate. 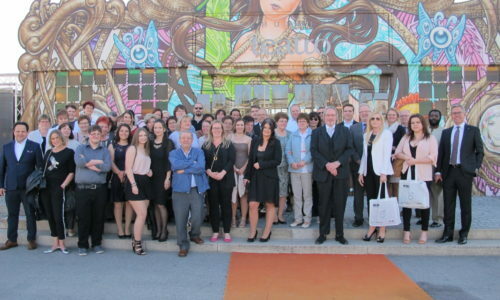 Ms Spielmannleitner is the fourth KMP trainee within three years to receive this prize at the end of vocational school. 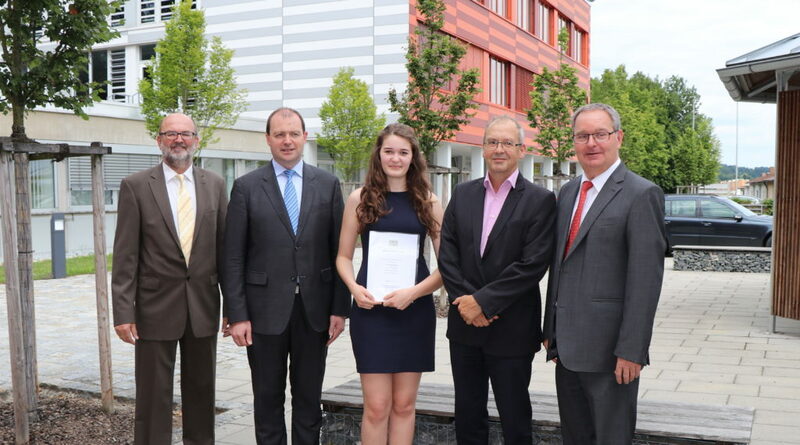 This state prize is given by the schools sector of the Government of Lower Bavaria for excellent results of apprentices and is awarded by the local vocational school. The awarded young people are honoured with a certificate, here in our local district Rottal-Inn, the district adds a book as a special attention. 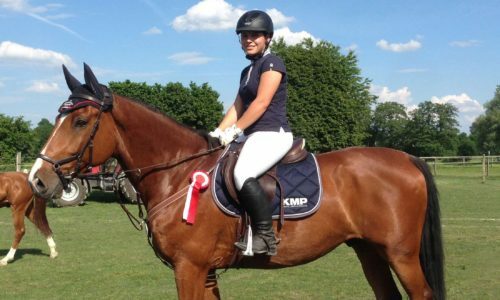 We are proud of our trainee and congratulate Selina Spielmannleitner on her outstanding achievements. 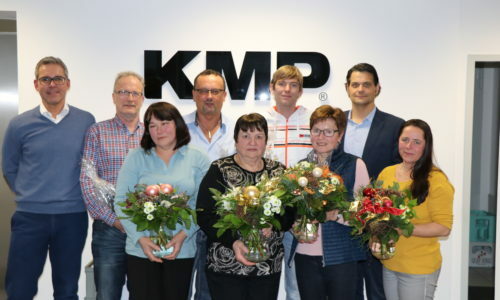 The celebration to the 30th anniverary of KMP was to become a cheerful party for the staff, and this was accomplished in the best way, as many colleagues reported. By bus, KMP went to the renowned “Schuhbecks teatro” in Munich where everybody enjoyed the excellent cuisine and the superior service in a unique atmosphere. The set menu was accompanied by varied entertainment with music, an amusing magic show, and breathtaking acrobatics. 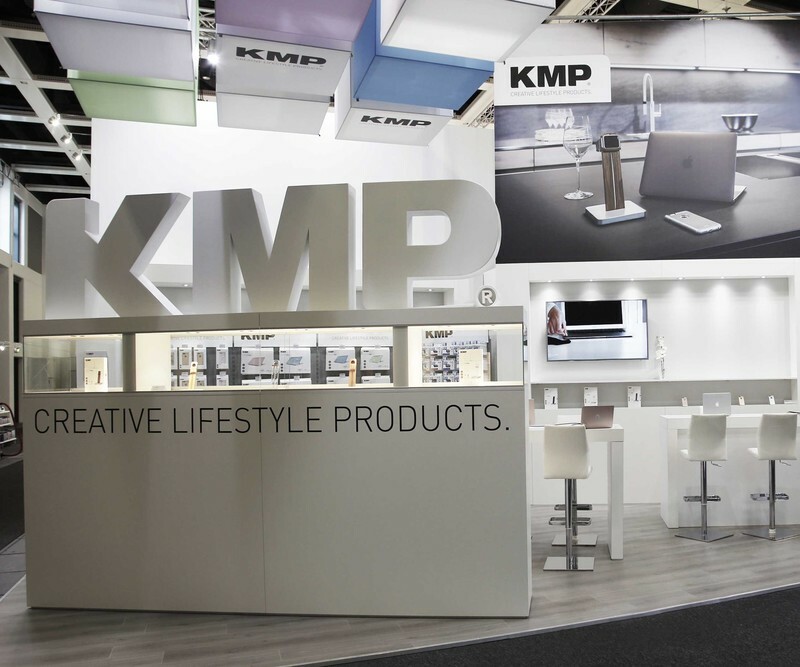 Started as a small ribbon factory, KMP has developed to a market leader for printer supplies. Inkjet and toner cartridges have long since dominated the product range, which is always kept up-to-date. The joyful atmosphere during the Christmas party was again perfect for hounoring long-term employees. CEO Jan-Michael Sieg thanked Appolonia Bär and Rosi Messner for 20 years and Stefan Unterbuchberger for 10 years of loyalty. 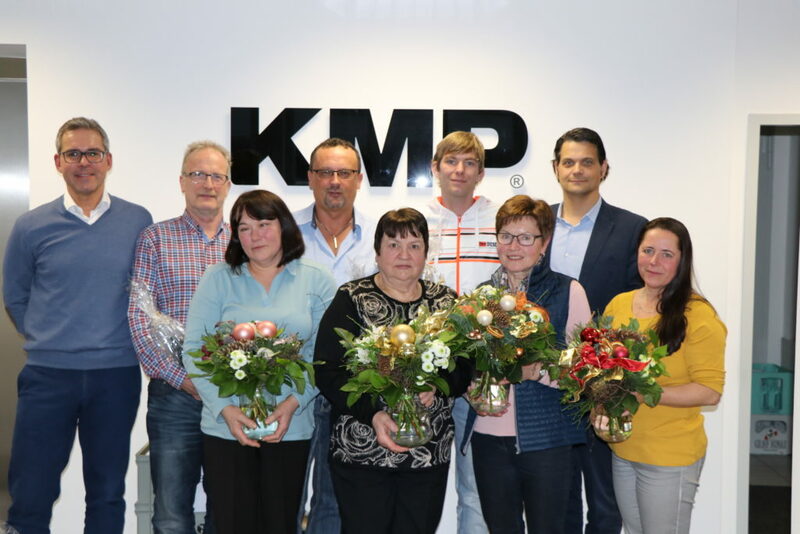 Jan-Michael Sieg himself, Galina Rapp, Lutz Heim, Rainer Höchsmann, and Monika Kaltenegger could celebrate a notable birthday this year and received the best wishes of the company. Another highlight was Klaus Reissig’s performance on the saxophone. KMP’s salesman for Austria delighted the colleagues with jazzy interpretations of popular Christmas songs. 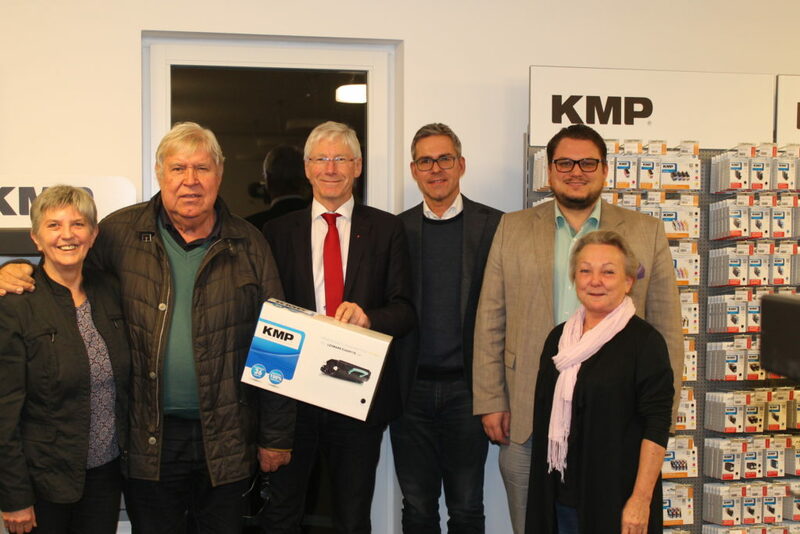 KMP further thanks Volker Kappius of Delacamp AG who was a spontaneous guest and gave a generous prize for the employees’ tombola. 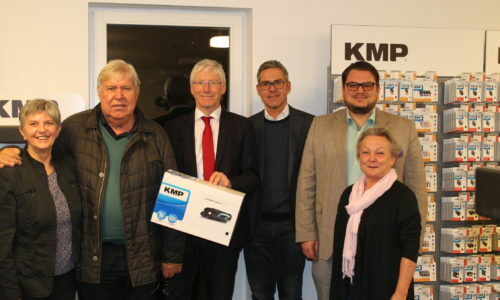 Bernhard Roos, member of the Bavarian State Parliament, visited the headquarters of the KMP PrintTechnik AG in Eggenfelden, Germany, together with a delegation.
. Learning how the entrepreneurs see the economic framework conditions in Lower Bavaria was important to Mr Roos, and further to learn their opinion about what politics can do to promote the local economy. 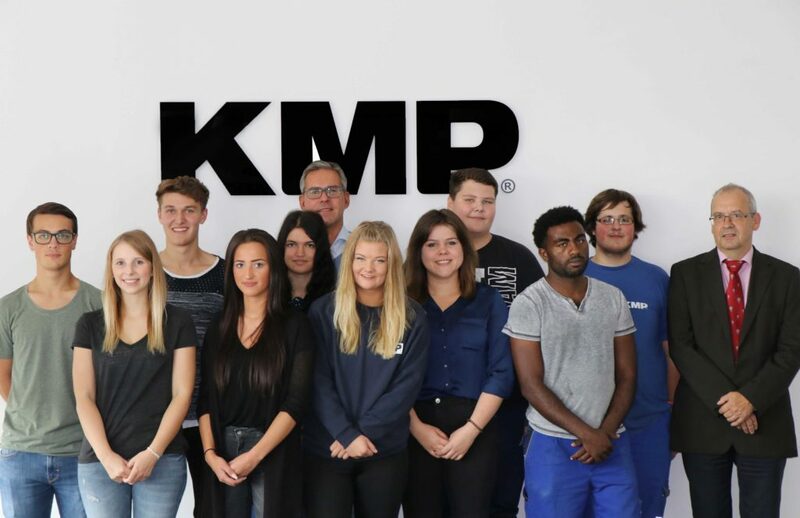 He as well as his attendants showed their interest and were very pleased about KMP’s current position in the market and the company’s role as an employer and vocational trainer in the region. 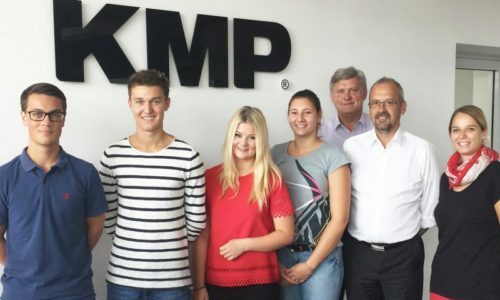 Three young people have started their vocational training at KMP PrintTechnik AG this year. This training according to the German apprenticeship system lasts around three years. Celina Vanessa Liebert (5th person from the left in the picture) and Lara Sieg (5th from the right) are trained as industrial clerks, Manuel Kaufmann (4th from the right) as warehouse clerks. Moreover, Addisu Gemede (3rd from the right) prepares himself for a vocational training at KMP. All four adolescents were cordially welcomed by CEO Jan-Michael Sieg (middle of the back row) and authorised officer Werner Watzinger (on the right). 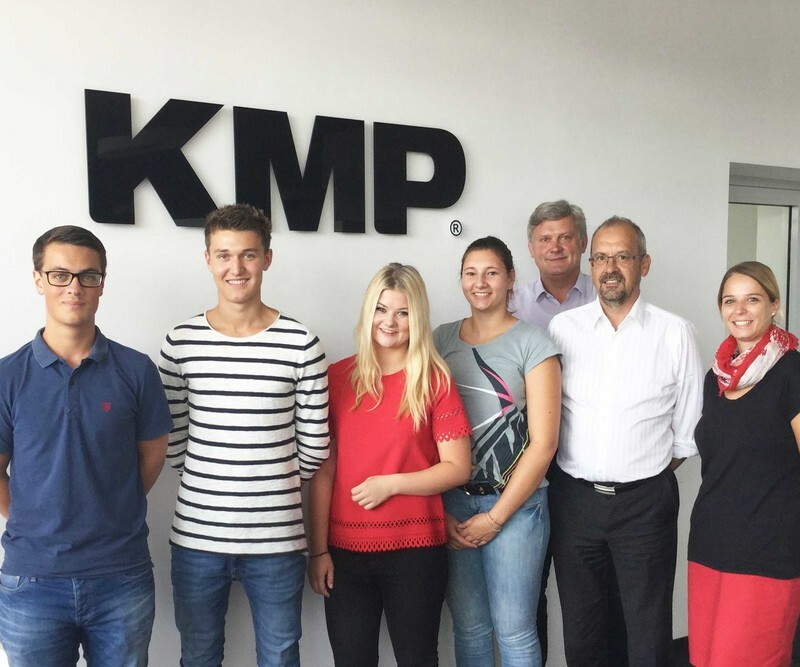 “KMP trainees are quickly integrated into our operational procedures. 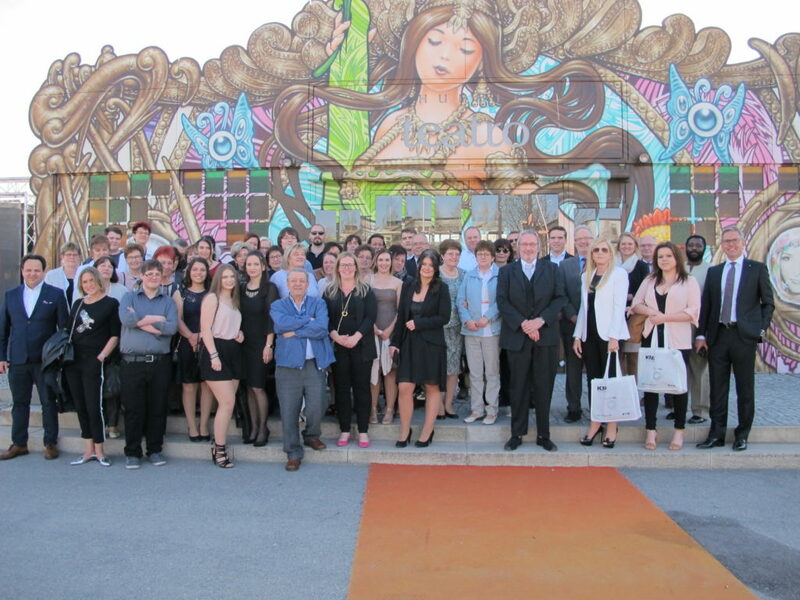 Our employees commend the young people’s motivation and commitment time and again”, Sieg expresses his pleasure. The further persons in the pricture are the KMP trainees who are in their second and third year of training. This year we are with our Creative Lifestyle Products at the International Consumer Electronics Fair (IFA) in Berlin. From 01.09-06.09.2017 you can admire our wide assortment and all the latest innovations on our large exhibition stand. You’ll find cases and protective glasses for the new iPad Pro 10.5 “, bags for the new MacBook Pro 13” and much more. So take a look and visit us in Hall 4.2a, Stand 119. 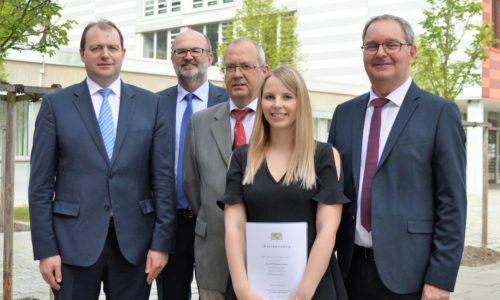 Our trainee Kathrin Bauer was awarded the Lower Bavarian State Prize at a ceremony. Ms Bauer who finished her training for industrial clerks, received this prize for the top grades in her vocational school’s leaving certificate. 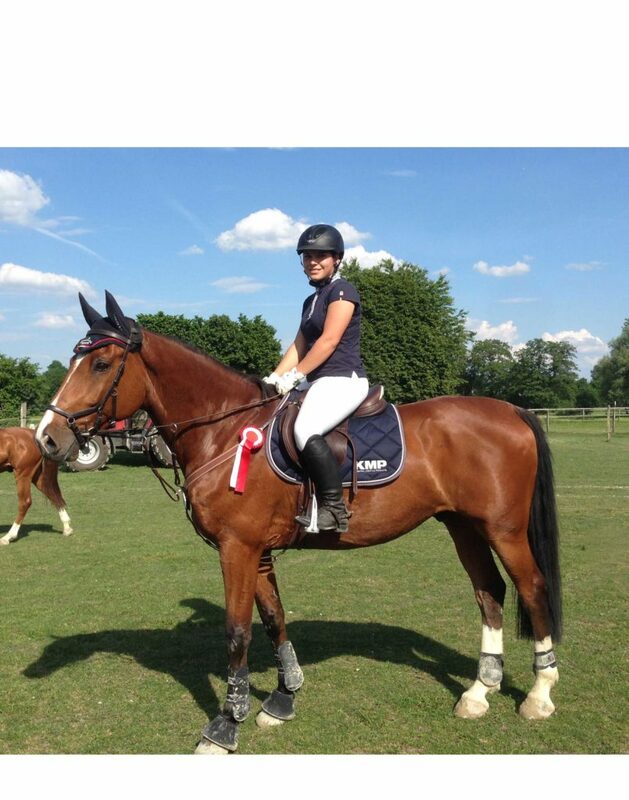 We are proud of our trainee and congratulate Kathrin Bauer on her outstanding achievements. Numerous colleagues were delighted about a one-day seminar about time and stress management. 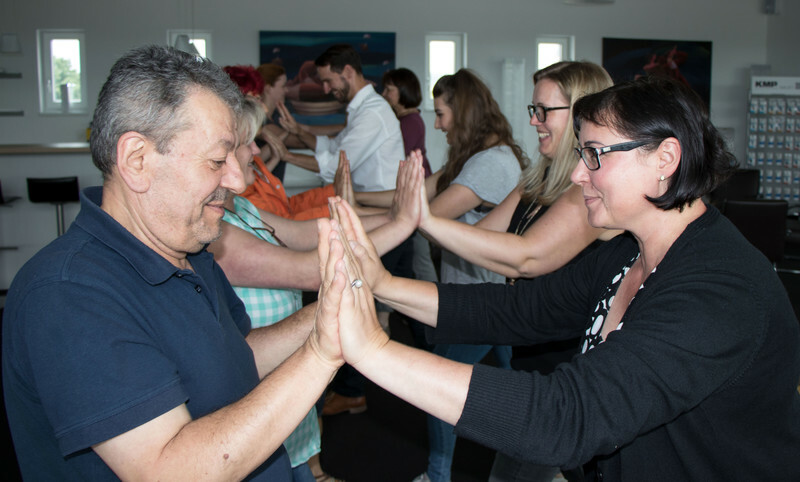 In an entertaining way, trainer Fred Zimmermann first imparted theoretical knowledge on how to dissolve blocks in business and private life and how to become aware of one’s own behavioural patterns. Practical excercises for everyday life followed. These exercises that aimed to improve and maintain health where carried out in a group. The KMP team was obviously excited and the participants went home with many suggestions and exercises for their personal time and stress management. 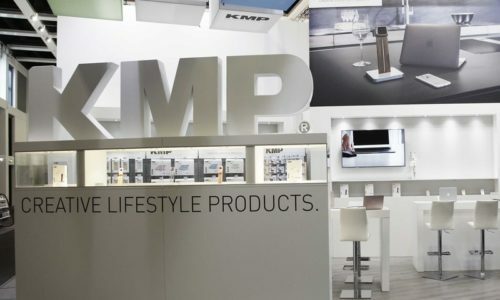 Again this year, KMP is once again a successful sponsoring partner. We would like to congratulate our starter for her position at this year’s Reitturnier of the Reit- und Fahrverein Altötting / Mühldorf e.V. and wish her continued success for the tournament season. 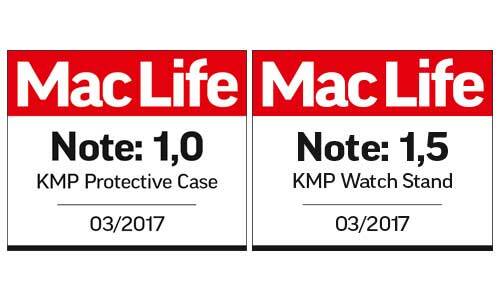 Two of our products were scrutinized more closely in the MacLife magazine and proved in the test. Our Protective Cases for MacBook Pro Retina 13 “and 15” were awarded the top score of 1.0 by the specialist magazine. Also our Watchstand got a great value of 1.5. Premiere in Berlin. 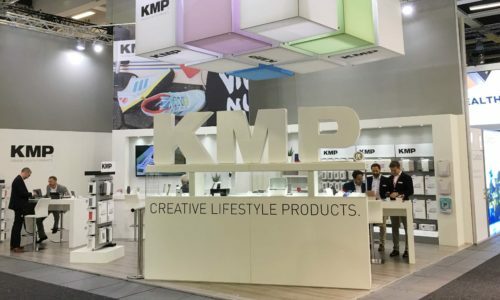 KMP was for the first time on the IFA 2016 in Berlin. IFA is the global leading fair for conversation electronic and elektro home appliances. Our new brand “CREATIVE LIFESTYLE PRODUCTS” was very successfull and many people were interested. In addition to the existing portfolio with high quality accessoires for apple products presented our team also new development. So it will be exciting. We are happy to visit the IFA 2017 again after this amazing start. The trainees start these days their on-job training at KMP. In the next three years they will be trained within the company as an industrial clerk and warehouse clerk. All of them are highly motivated and they look forward to the new tasks and challenges during the next months. Stefan Harböck and Nico Reitenberger started their training as industrial clerk. And two girls will be trainend as warehouse clerk: Saskia Hohenwarter and Jacqueline Mahnke. The career start is a big step for the working life of the trainees. KMP ensures that the newcomers feel comfortable and well-integrated. They will be very well educated in the respective departments of their industry. We look forward to a good cooperation and wish the trainees a lot of fun at work and a good start.